How to Check Your Website's Keyword Ranking Accurately? 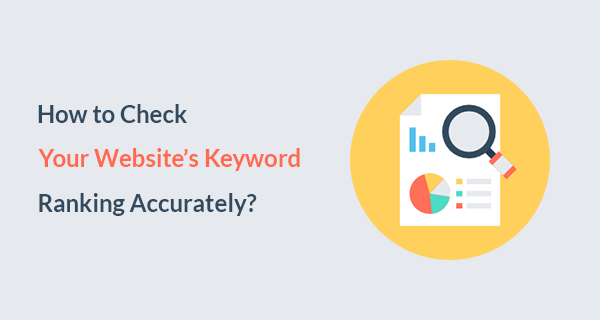 Blog » SEO » How to Check Your Website’s Keyword Ranking Accurately? How to Check Your Website’s Keyword Ranking Accurately? Are you seeing different keyword ranking whenever you search your keywords on Google? There are better ways to track your website’s keyword ranking more accurately. Why should you Check Keyword Ranking? It is a great way to know if your small business content strategy is working or not. If working, then how you can further improve the ranking. It can answer, questions like these and more. There are multiple ways to track keyword positions accurately. You can use Google Search Console to find out keywords, clicks, and impressions all of your keywords getting in search results. You must have Google Search Console access and verified property on GSC in order to get the search analytics. Note: If you recently created and verified your website’s property on Google Search Console, it will take it some time to load the data. Google Search Console is not run in real time, it gets updated when Google crawls your website. If you update your website frequently you will see results in GSC quicker. 1- Go to Google Search Console and your verified property dashboard. 2- By clicking on search traffic, there will be a drop-down menu appears. You can click on Search Analytics to open it. 3- Here, you can find out which keywords are people using to access your website, impressions all your keywords getting, and average search position of all those keywords. You can also download these search results and keyword positions in a CSV file by clicking the download button. You can find that button at the very bottom of the Search Analytics page. Most of my client’s don’t know how to track their keyword rankings properly. Google show personalized search results to each user individually. It doesn’t matter if the user is logged into Google or not. Google stores a cookie in your browser which records your activity on the Internet (which is creepy). After storing your data, whenever you search on Google about your interests, it will show you search results influenced by your browsing history and recent search history. To see accurate search results, you can use incognito or private mode in your browser. 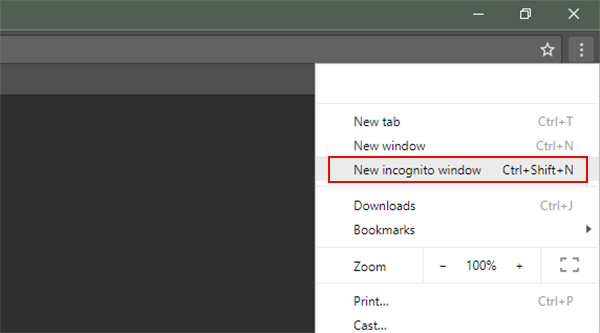 On Google Chrome you need to go to Chrome settings menu and need to select New Incognito Window. Alternatively, you can use a keyboard shortcut Ctrl+Shift+N. If you are using Mozilla Firefox browser you need to press the settings, select New Private Window. Alternatively, you can use a keyboard shortcut Ctrl+Shift+P. Using a private/incognito mode will turn off cookies recording and influence your browsing experience. If you want to search in different countries, you can use any VPN to change your country. Make sure to also change the Google domain to country specific domain. 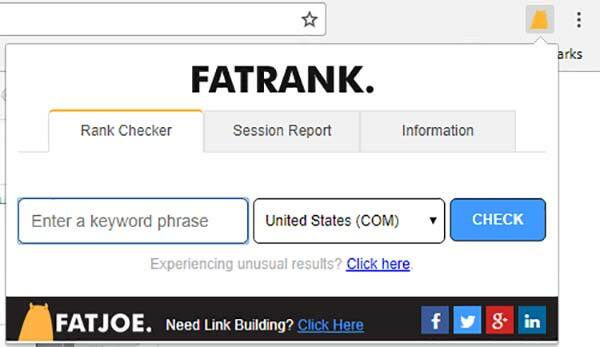 FATRANK is a Google Chrome extension which you can install for free. You can check any keyword ranking in multiple local regions. You can install this extension in your browser. After installing this extension, you will find an icon at the top right corner of your browser. By clicking on it, a drop-down menu will appear. They may ask for your email address to get started. Now, go to any website or a particular web page and open this tool again. Enter any keyword from that page. It will tell you if that particular page is ranking in 100 top search results or not. If it is ranking, it will also tell you the position. It is also a great way to keep an eye on your competition keywords. You can use multiple third-party tools & websites to check keyword ranking. These are equally good ways of check ranking of keywords. However, features differ in each tool. You can find out any website’s top ranking keywords quite accurately with this tool. However, it is not a free tool. If you want full functionality you have to buy the product. If you want to use it free, signup on SEMrush and start using it. Here’s how to track your website’s keyword ranking using SEMrush. Type any website address in the SEMrush search box. Now at the right menu bar, you will find an option Domain Analytics. Clicking on it will open a drop-down menu. From this menu, select Organic Research. You will find top 10 keywords that your website is ranking for (if you are using the free version). By using this website you can check keyword ranking of any website on particular keyword online. It is a paid tool, however, a free version has limited functionality and you can search limited times. Enter keyword and domain name in the search. It will show you where this domain is ranking on that particular keywords. To get more functionality out of this tool you either have to create a free trial account or buy the tool. Which one of these tools do you use to track keyword ranking? If you didn’t know how to check your website’s keyword ranking in Google accurately, and this post helped you. please feel free to share it.